Microsoft has constantly come under fire in the last several years. It has ventured into less profitable areas, used monopolistic business practices, and is receiving a public thrashing from Google in search technologies. However, no one can dispute the fact that this company makes money hand over fist. The company carries no debt and holds over $20 billion in cash. 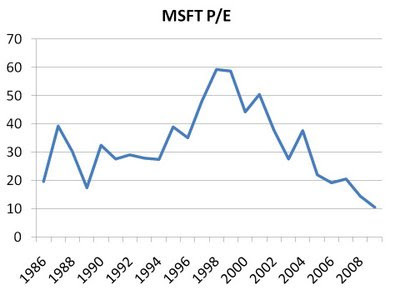 Even though PC sales may slow in the short-term, it's hard to believe that a company with the low financial risk and the global reach of Microsoft can have a P/E under 10.